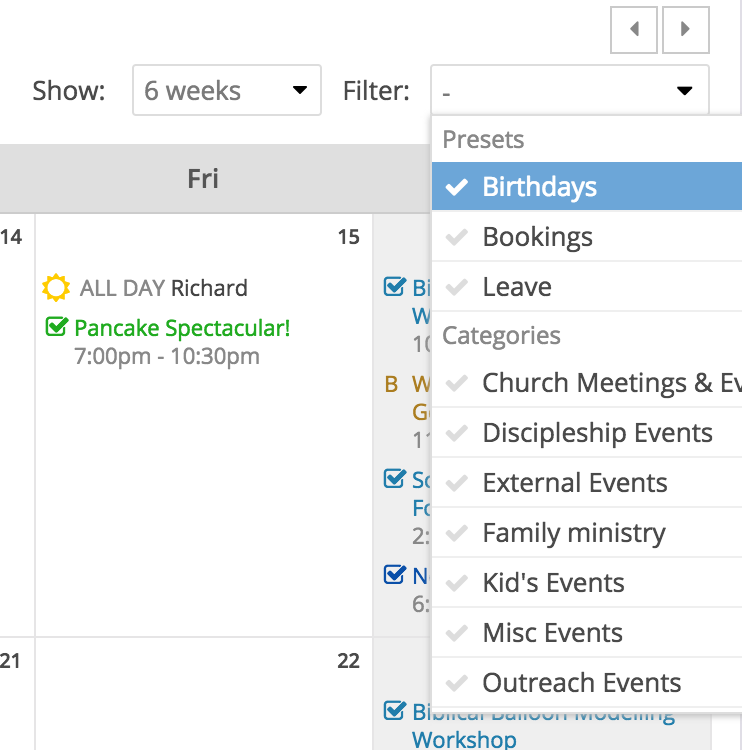 Being able to filter your Calendar module calendar is a useful feature in busy churches where there's lots happening on the calendar. When viewing your calendar in the Calendar module, you can apply filters to the change which categories of events to view (or not view). In addition to filtering on your categories, we've also made it possible to filter system presets: [user] birthdays and leave, and bookings (i.e. bookings not already linked to an event that have the "Show in Calendar?" option checked on the booking). For example, ticking "Bookings" will hide all events and just show Bookings - Notice how your bookings have a "B" before them in the calendar, making it easier to distinguish between events and bookings. Note: Birthdays are not intended to show for all Address Book contacts. Your events calendar will however show the birthdays for all Users whose profile has been linked to an underlying Address Book contact with a date of birth. Never forget a staff member's birthday again!